It seemed a lot longer, but Tanner was only with our family for 972 days. 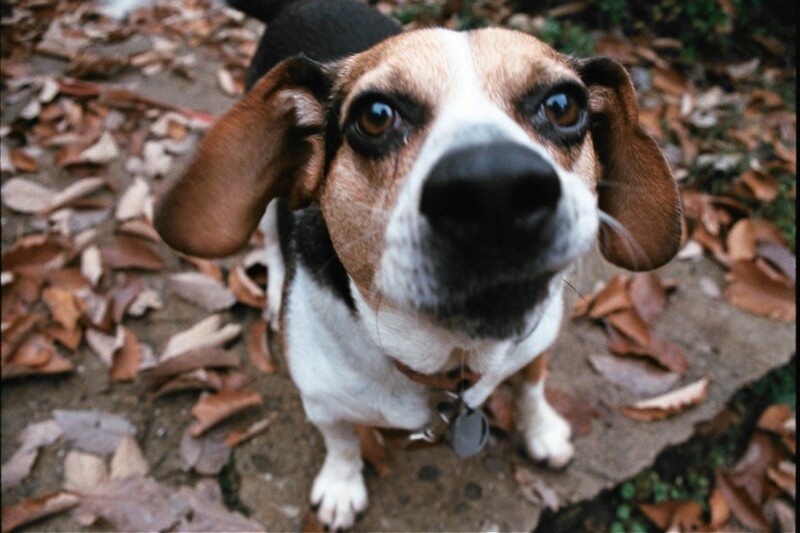 Tanner was the beloved beagle we adopted from Pets Alive, a no-kill animal shelter that strives to find “forever homes” for abandoned dogs, cats, horses, pigs, and other destitute creatures. For two and a half years, Tanner bought immeasurable joy to our lives. 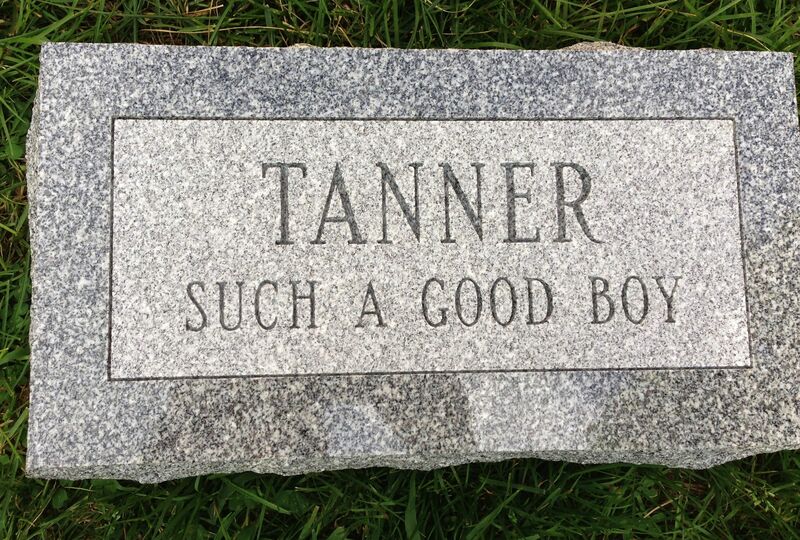 On May 17, at the young age of 7¾, Tanner died due to kidney disease. In honor of our laying down his gravestone this weekend, I wanted share some memories of how he impacted our lives. Tanner was hardly a puppy when we got him. According to his records, Tanner was five years old. (If you believe in the concept of “dog years,” Tanner and I were the same age last fall—and I would kindly implore you to not do the math.) Pets Alive had rescued Tanner from a large dog pound in North Carolina, where he was scheduled to be put to death via gas chamber, a process that many animal advocates consider heartless and inhumane. 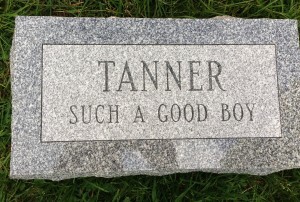 Our veterinarian suspected that Tanner had probably been a hunting dog, who was no longer considered useful to his people. Before this gets too depressing, let me get to the reason I’m writing about Tanner now—to celebrate and honor our time with him. Before these details fade from memory, I want to share some stories about his marvelous life with us. As a parent of two, I also want to talk about how having a pet die turned out to be meaningful, powerful experience for my children. On September 18, 2010, we went to Pets Alive to meet Tanner. (That was the name he came with, and we kept it, figuring the poor guy had enough dramatic changes in his five years. 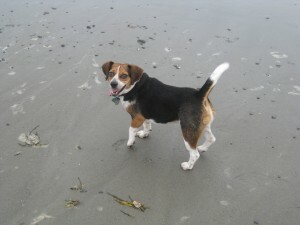 We might have thought differently had he been named “Manson” or “Dahmer.”) My wife Ellen, eager to get a beagle, had spotted Tanner’s photo on Petfinder.com. From the moment we took him for a walk, we knew that he was the one. 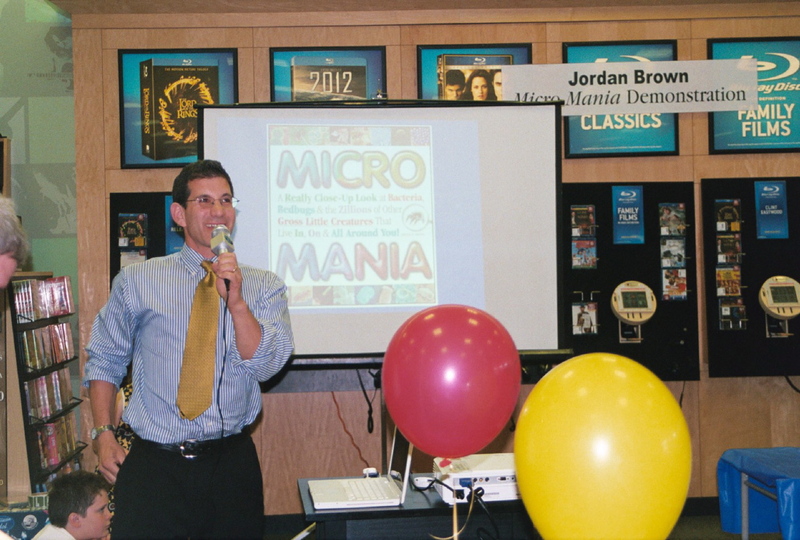 He was bursting with energy and playfulness. On the way home, our first stop was lunch at Wendy’s. No dogs are allowed inside, of course, so we dressed up Tanner as a human and… (Just kidding, wanted to see if you were paying attention.) We actually went through the drive-thru, and parked near a picnic table, so Tanner could wolf down a burger (minus the bun). For Ellen and me, one of the joys of having a dog is letting him or her sleep at the bottom of the bed at night. It took several weeks for Tanner to feel comfortable doing this. Given his previous life, we wondered if he had ever slept inside. For weeks, when we tried to go to sleep with him, he’d leap off the bed and jump up on bedroom chairs, sniffing out the window. Gradually, however, Tanner learned to love lying at the foot of our bed with us. About two months after we’d adopted Tanner, he developed a hacking cough, and seemed to have troubles walking. I took him to our local vet, known to all as “Dr. Kate,” and she ran some blood tests. She was concerned that he might have Lyme disease, quite common in our area. When the tests were completed, she came into the room where I was playing with Tanner. She asked, “How much are you attached to this dog?” I responded, “What? What are you talking about?” She explained that Tanner’s blood tests showed that he had heartworm! She didn’t know how advanced it was, but if left untreated, he would be dead in a matter of months. Dr. Kate said that she didn’t mean to be harsh, but she wondered if it might be best for us to return Tanner to Pets Alive, and get a healthier dog. No way!! 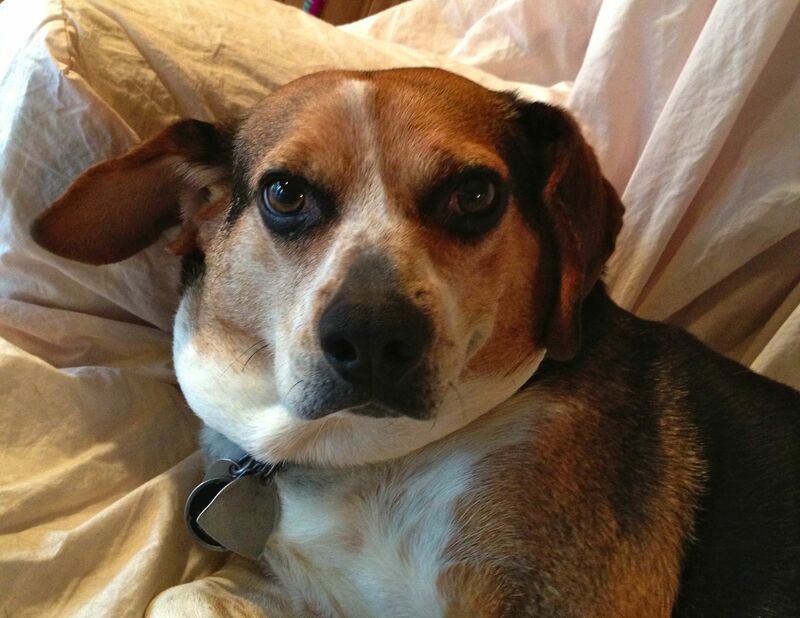 Our home was Tanner’s “forever home.” But his having heartworm presented a mystery. His paperwork from Pets Alive showed that he tested negative for the disease, and we had faithfully given him his heartworm meds. After consulting with my sister, the vet, Dr. Kate figured out what had happened. Tanner had contracted heartworm (transmitted via mosquitoes) down South, prior to his being rescued by Pets Alive. There were roundworms growing inside Tanner’s lungs, and other vital body parts. Since the disease was in the early stages, it had not shown up in the bloodwork beforehand. Dr. Kate and Sharon discussed his case, and determined that there was hope. With careful planning and expensive injections, Tanner could be parasite-free in a couple of months. So, we went through the treatment, and Tanner dodged the bullet! We figured he’d live to a ripe, old age with us. Every summer, for the last twenty years or so, Ellen and I have visited the same beach in Kennebunk, Maine. Known as Gooch’s Beach, it might be better be called Pooch’s Beach. That’s because before 9 am and after 5 pm, dogs are allowed to roam free there with their owners. Dogs get to fetch balls, run with abandon, sniff new friends, and even frolic in the ocean. Here’s a picture of Tanner on the surf. We’re headed back to Maine in August, and we will miss having him with us on the sand. A few months after we got Tanner, my son discovered another one of our dog’s favorite things to do. Finian would lie on the ground and gently bring Tanner on top of him, as if Tanner were the all-powerful Alpha Dog. Tanner would wag his tail uncontrollably and lick Finian’s face for what seemed like forever. I’m so glad I was able to capture such a moment in this photo. In March of 2013, Tanner was experiencing back pain. He’d yelp sometimes when we picked him up, and didn’t seem himself. So, I took him to Dr. Kate for a checkup. She checked him for Lyme (tests were negative), and examined his various vertebrae. She discovered he had one sensitive area, but didn’t want to start steroids unless absolutely necessary. She suggested that we give Tanner aspirin, and let him take it easy. But the problem didn’t go away. Several weeks later, Sharon suggested Dr. Kate ran some blood tests to see what was going on. It turned out that Tanner’s kidneys were in bad shape, and that it was critical he be put on an IV as soon as possible. Dr. Kate said the costs could be high, and recommended we bring Tanner to my sister’s vet hospital in New Jersey right away. Panicked, I took the kids out of school, packed up Tanner, and we were off. Sharon, a holistic vet, kept Tanner for a couple weeks. She ran numerous tests to try to figure out what was going on. It seemed as though his kidneys were barely working. In addition to putting Tanner on an IV, she gave him acupuncture, which he enjoyed. She prepared him special foods (which he nibbled at), and administered fluids to flush his kidneys daily. 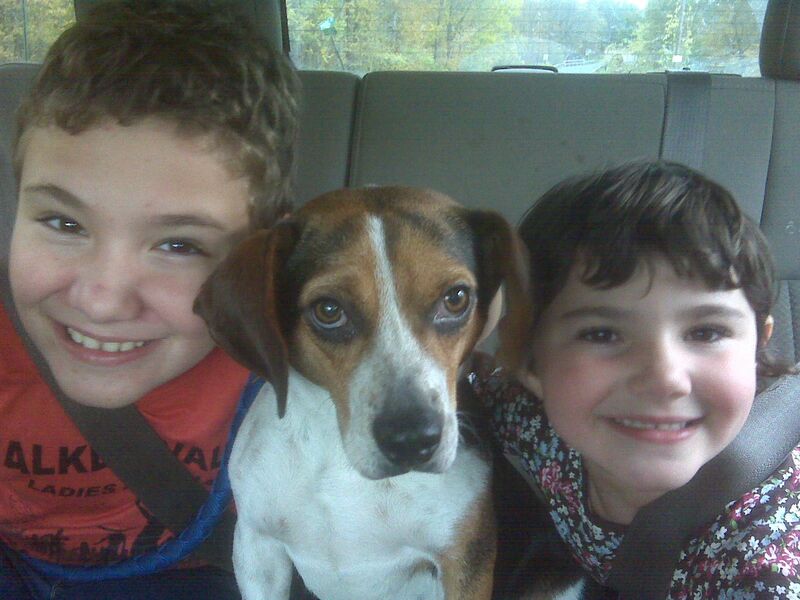 Once his condition stabilized, we returned to my sister’s home to bring Tanner home. When Tanner saw me, he barked, wagged his tail, and even did that cute lying-on-top-of-me thing described above. Sharon then gave me a long list of the meds I would need to give him. The most dramatic change was that I would have to give him subcutaneous fluids—twice a day—for the rest of his life. In other words, I’d have to inject a needle under his skin twice a day and let IV fluids drain into his body. It was sort of like doggie dialysis—since his kidneys could no longer flush the toxins out of his body. I felt squeamish at first, but wanted to do anything to help Tanner feel better and stay alive. Tanner hung on for another couple weeks, but then stopped eating. We knew things were bad when I drove him to McDonald’s and bought him a burger, and he sniffed at it, but didn’t try eating it. He didn’t seem in pain, but he seemed perpetually uncomfortable. I would lift him up to his favorite chair, and he would “ask” to be taken down. That afternoon, I put Tanner in the car, and picked up Finian and Olivia at school. With tears, I told them the very sad news: It was Tanner’s last day with us. 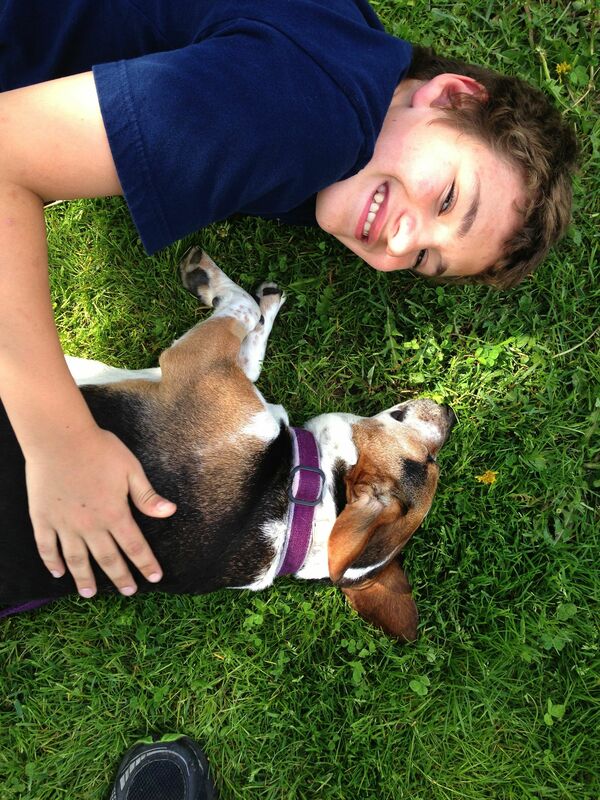 At the playground at school, Tanner found a cool spot in the grass and relaxed on the ground with Finian. The kids petted him and told him how much they loved him. It was clear from Tanner’s eyes that he was not feeling well. He wasn’t wagging, he wasn’t licking. His spark was gone. That night, the whole family spent their last hours with him. At bedtime, Tanner made his usual rounds, first going to Olivia’s room, then Finian’s, and finally ours. Ellen got home from work late that night and cuddled with Tanner on our bed. I had troubles sleeping, worrying about having to bring him to the vet the following day. I knew that Tanner was quite ill but wondered if maybe, just maybe, we might do something to extend his life a little longer. Was it really time to say goodbye? When Ellen and I woke up early the next day, we discovered that Tanner’s body was stiff. He had died peacefully in his sleep. When the kids awoke, they got to see his lifeless body, and give him one last pet. His bodily fluids were starting to leak, so I wrapped him up in a blanket and plastic bag, and put him in our garage to keep his body cool until that evening. Shortly before sundown, after I had a chance to dig a grave on our property, next to Satchmo’s, our family gathered to bid our final respects. We buried him along with some of his favorite toys. Finian and Olivia each wrote him a note, which we also put in the grave. Bye, Tanner. We miss you! Posted in Catchall, Jordan D. Brown, Parenting Advice, Pets | Permalink | No Comments ». Add yours! Happy New Year! My first resolution of 2012 is to blog more often. 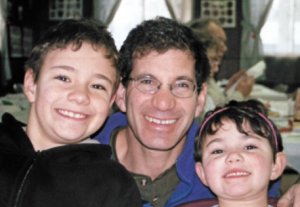 Back when I wrote a monthly parenting column for Sesame Workshop, I had a great excuse to capture all the amusing and precious details of my children’s lives, and my often humorous struggles as a parent. While an archive of these columns lives on elsewhere on this website, it’s time for some fresh material. 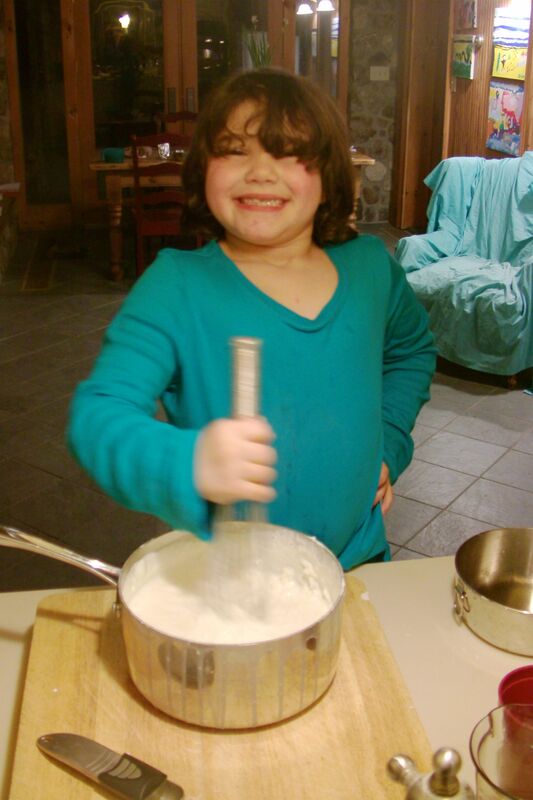 I decided to share a fun story about making rice pudding with my daughter Olivia, now 7. Yesterday, on the last day of vacation before she and Finian return to school, Olivia said she wanted to “do an experiment.” My wife and I know that this is code for “turning the kitchen into a tornado of ingredients.” Getting Olivia to try an actual recipe is sometimes tricky. She’d much rather mix random stuff from our cabinets and see what happens. I love the freeform cooking approach, but I want her to see that she’s capable of making some of her favorite dishes. She got a big kick measuring the rice, running her hands through the grains (“You washed them, right honey?”), and pour the whole quart of half-and-half into the measuring cup. I even threw in a little science prediction: “Do you think the measuring cup with overflow?” When it was gone, Olivia proudly sprinkled cinnamon on each dish and served it to our family. It was DELICIOUS! (And I just realized there are leftovers in the fridge, and I’m the only one home… Hmm.. the possibilities are endless. 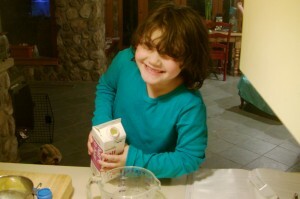 I’d love to hear any great stories you’d like to share about cooking with kids. Have a wonderful 2012. I’ll write again soon. Promise! Posted in Catchall, Food, Glorious Food, Jordan D. Brown, Parenting Advice, science | Permalink | No Comments ». Add yours! Happy December! And Happy Chanukkah to those out there who celebrate this holiday! Posted in Catchall, My Latest Work, Parenting Advice, Sesame Workshop | Permalink | No Comments ». Add yours! Hey, it officially summer! I hope all the fathers out there had a terrific Father’s Day. I know I did. Despite my daughter being hit with a wave of nausea at 4 AM (read: “projectile vomiting”), the day actually turned out quite well. And my family gave me a generous gift to push me in new culinary directions. While I’m pretty sure I never uttered the phrases “barbeque smoker” and “I’d really love a” in the same sentence, this gift was surprisingly fun – and the resulting ribs and chicken were bursting with flavor. The best part was assembling it with Finian, who LIVES for figuring out how things work. Speaking of Father’s Day, you might enjoy my latest parenting column for Sesame Workshop (see PDF below). Would love to hear your thoughts and reactions — feel free to post them below. Posted in Catchall, Jordan D. Brown, Parenting Advice | Permalink | No Comments ». Add yours! 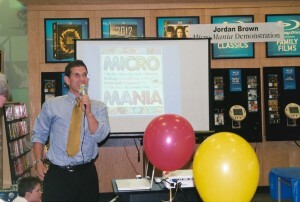 Posted in April Fools' Day, Catchall, Humor and Comedy, Jordan D. Brown, Parenting Advice, Sesame Workshop | Permalink | No Comments ». Add yours! Peter and I Agree: Reading Harry Potter to Your Kids Is Magical! Super blog entry – it made my scar burn with pleasure. I, too, am a dad who loves to read the Potter books to my children. 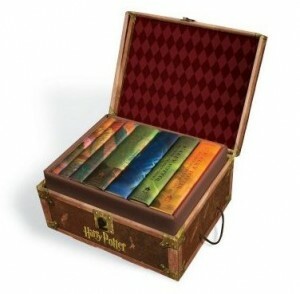 My son Finian is almost nine, and we’re in the middle of the interminable Book 5 (Order of the Phoenix). Reading the stories to him in the early morning and at bedtime is one of the highlights of my day. We have a strict rule that we can’t see the movie of a particular story until we’ve finished the book. It motivates us – and it avoids spoiling any of the surprises. One thing no one has mentioned so far is that the audiobook versions of the Potter series read by actor Jim Dale are friggin’ AMAZING. This is actually the way I experienced the first few books many years ago -before I had kids. Whenever I try to invent voices for the various characters, I am more often channeling my inner Jim Dale rather than lifting vocal quirks from the movie versions. And I totally agree — trying to do Hagrid’s voice is a blast. I’ll leave you with this amusing tidbit — my daughter Olivia (age 5) sometimes joins us when I read the Potter books to her brother. Hilarious the bits she picks up. We were listening to the HAIRSPRAY sound track in the car, and she thought the opening number was “Good Morning, Voldemort” (vs. the actual “Good Morning, Baltimore”). Posted in Catchall, Harry Potter, Parenting Advice | Permalink | No Comments ». Add yours!